You are invited and encouraged to let us know the name and yahrzeit (the date of death) of your beloved ones who have departed from us. We will honor their memory by announcing their name at our synagogue during services according to the Hebrew Calendar. May you be comforted among all the mourners of Israel. In Jewish tradition, when the year of mourning is over, mourners are expected to return to a fully normal life. There are several occasions each year when our loved ones who have passed on are memorialized. The most significant of these is yahrzeit, the anniversary of the death, which is observed according to the Hebrew calendar. As is the case in all Jewish holy days, yahrzeit observance begins at night. 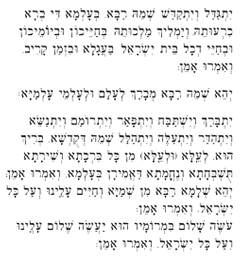 A 24-hour candle is lit and one may attend synagogue to recite the Kaddish [the memorial prayer]. It is traditional to avoid attending any celebrations or parties on the day of yahrzeit, and some people fast on that day. 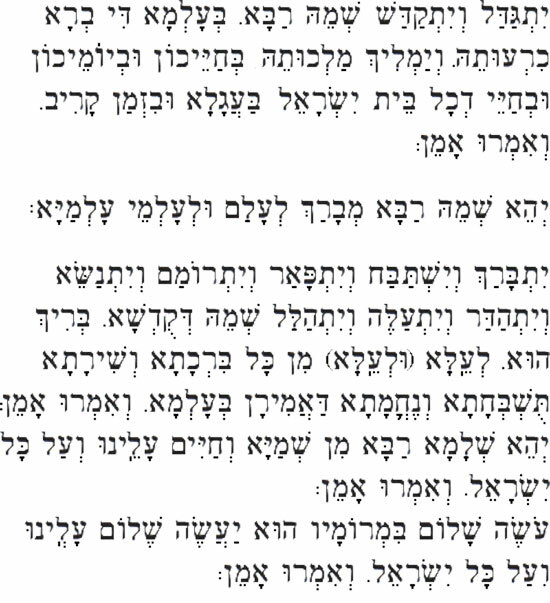 The other observances are called Yizkor (memorial service) and are observed four times during the year: at the end of Pesach (Passover), Shavuot, Yom Kippur and Shemini Atzeret/Simchat Torah (the end of Sukkot). Yit-ga-dal v’yit-ka-dash sh’mei ra-ba, b’al-ma di-v’ra chi-ru-tei, v’yam-lich mal-chu-tei b’chai-yei-chon uv’yo-mei-chon uv’chai-yei d’chol-beit Yis-ra-eil, ba-a-ga-la u-viz-man ka-riv, v’im’ru: Amen. Y’hei sh’mei ra-ba m’va-rach l’a-lam ul’al-mei al-ma-ya. Yit-ba-rach v’yish-ta-bach, v’yit-pa-ar v’yit-ro-mam v’yit-na-sei, v’yit-ha-dar v’yit-a-leh v’yit-ha-lal, sh’mei d’ku-d’sha, b’rich hu, l’ei-la min kol bir-cha-ta v’shi-ra-ta, tush-b’cha-ta v’ne-che-ma-ta, da-a-mi-ran b’al-ma, v’im’ru: Amen. Y’hei sh’la-ma ra-ba min sh’ma-ya, v’cha-yim, a-lei-nu v’al kol-Yis-ra-eil, v’im’ru: Amen.. O-seh sha-lom bim-ro-mav, hu ya-a-seh sha-lom a-lei-nu v’al kol-Yis-ra-eil,v’im’ru: Amen. Glorified and sanctified be God’s great name throughout the world which He has created according to His will. May God establish God’s kingdom in your lifetime and during your days, and within the life of the entire House of Israel, speedily and soon; and say, Amen. May God’s great name be blessed forever and to all eternity. Blessed and praised, glorified and exalted, extolled and honored, adored and lauded be the name of the Holy One, blessed be God, beyond all the blessings and hymns, praises and consolations that are ever spoken in the world; and say, Amen. May there be abundant peace from heaven, and life, for us and for all Israel; and say, Amen. The One who creates peace in His celestial heights, may God create peace for us and for all Israel; and say, Amen. May they rest in peace and may their memory ever be for a blessing… At this moment, I pause for thought in memory of my beloved………………………I give thanks for the blessing of life, of companionship and of memory. I am grateful for the strength and faith that sustained me in the hour of my bereavement. Though sorrow lingers, I have learned that love is stronger than death. Though my loved one is beyond my sight, I do not despair for I sense my beloved in my heart as a living presence. Sustained by words of faith, comforted by precious memories, we kindle the light in remembrance. “The human spirit is the light of Adonai” (Proverbs 20:27). As this light is pure and clear, so may the blessed memory of the goodness and nobility of character of our dear…………..illumine our souls.